Blog Everyday Heroes – our winners! Everyday Heroes – our winners! 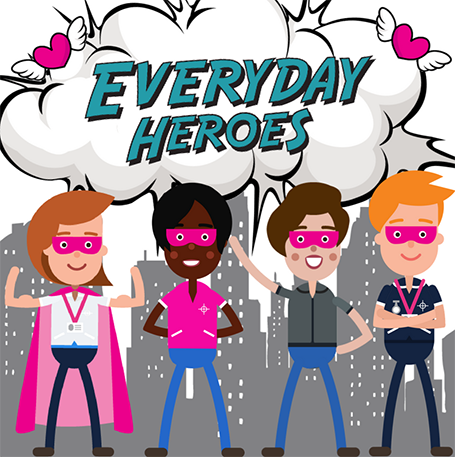 When we launched the Everyday Heroes awards, as a way to promote and reward the incredible efforts made by healthcare agency workers (every single day) we had no idea how many incredible and life-affirming stories we were going to receive… from colleagues, service users, relatives, patients and friends alike. We got hundreds of entries, with each person wanting to give some much-deserved recognition to the Nurses, Care and Support Workers who had made a difference to their lives. Choosing the three winners was incredibly hard! However, we finally managed it and below are the details of our VERY worthy winners for each category. The team are incredibly supportive and have various projects including arts and crafts to help to uplift the mood of the group. It was clear to our Judges that Jo is compassionate, patient and empathises with everyone she works with. The support she gives along with her team truly makes a difference. She comes up with new ideas each week, working for The Prince of Wales Hospice Pontefract, stretching everyone’s abilities and minds. There are about 30 people, plus carers, who attend these groups, meeting in church halls in the community around Castleford, Pontefract and Altofts. The Judges commented on Jo as an inspirational person who also supports the group by giving them time to talk about their feelings. Jo and the team have also developed an ongoing project called “mindfulness”, to help the group stay positive when they are feeling down. The Judges felt that the groups are an opportunity for people to forge new friendships with others who are in similar situations and provide place to share and support, with the assistance of Jo and her team. The judges choose Suraya Alvi as the winner of the Carer category as they felt, in her role as a home care worker for older people, she is an inspiration – someone who truly strives to build a solid relationship with all of her clients giving them 100% of herself! She was described as having the ability to light up a room and has overcome her own personal adversity and serious illness with a smile on her face. Suraya now provides exceptional care to a young lady called Rebecca who suffers with autism, mental health problems and the genetic condition Ehlers-Danlos syndromes (EDS). The Judges noted that she has built a strong rapport with the family and goes out of her way to help them in way that she can. She has provided respite care, enabling Rebecca’s mother and partner to take time for themselves – offering not only physical and practical support for Rebecca but also emotional strength, always offering an ear to listen. Our winning Nurse, Sadie Smith, demonstrated to the Judges exceptional care and compassion towards 80 year old patient, Rachel Eden. Sadie was the senior clinical nurse assigned to care for Rachel and was a true tower of strength providing both practical and emotional support for Rachel and her family. The Judges felt that she went above and beyond what was expected of her, showing a genuine caring nature, always positive and caring – no matter the situation. She could always be relied upon to provide advice, offer explanation and help to allay any fears that Rachel had. The Judges saw that Sadie demonstrated real sensitivity upon discovering that Rachel suffered with claustrophobia, arranging and taking her to visit the CT scanner to help allay her fears to ensure she would not be too afraid when the time came to have her scan. She impressed the Judges with the close bond she built with the family, making herself available to answer calls for any questions they had and providing them with a helping-hand every step of the way. After Rachel decided she no longer wanted treatment in hospital and began palliative care at home, Sadie maintained regular contact with Rachel and her family, to check on her wellbeing and provide continued support. When asked about Sadie, Rachel Eden, said; “Sadie went over and above, put herself out and was very, very good to me. She made such a difference to how I felt about what was happening because she was so capable and helpful. I didn’t feel so scared because of Sadie”.